challenge those who live and work in the City of London to engage in intellectual debate on those subjects in which the City has a proper concern, and to provide a window on the City for learned societies, both national and international. 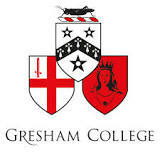 Gresham College has existed since 1597 in order to disseminate knowledge and information through our free public lectures. We positively encourage the use of the Gresham College lecture transcripts, audio and video files for all educational purposes. All Gresham College lectures are licensed under a Creative Commons Attribution 3.0 Unported License.